Our living room rug had stains on it. 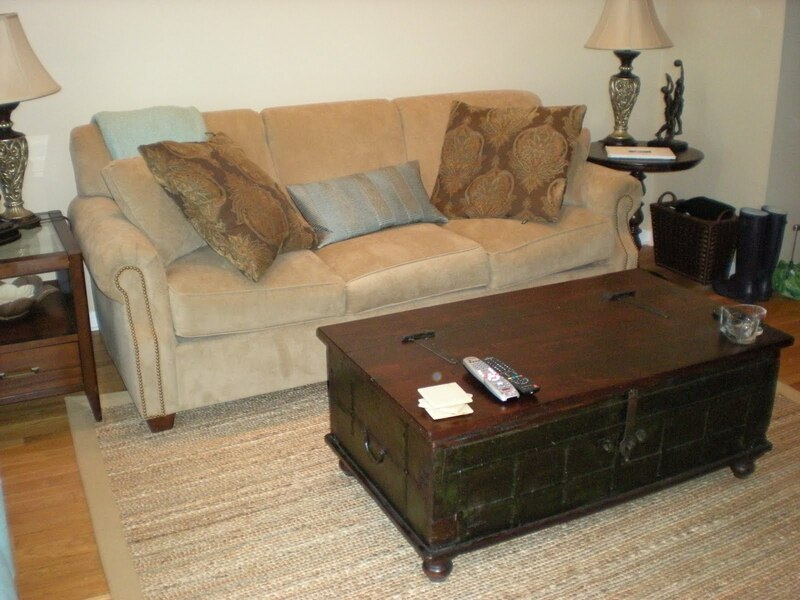 The beautiful, subtle pattern and creamy color were no longer the focal point. And after a lot of SpotShot and many comments from both sets of our parents, we decided we couldn't stand it any longer. The rug looked worn down, while the rest of the room looked new and nice. I had scoped out some 8x10 rugs via catalog at Crate & Barrel and Pottery Barn. Heeding my mother's advice to go see the rugs in person to feel them and look at them unrolled or on display, we headed out into the rain yesterday. Since we still have some Crate & Barrel gift cards from our wedding a year ago, that was our first stop. We found the rug section on the 4th floor in the Michigan Avenue store, and I loved the natural sisal and jute rugs... but then we noticed the prices. Those were not the ones I had seen in the catalog for $200! The lady working in that section directed us to the 2nd floor, but those rugs were not nearly as comfy (of course!). 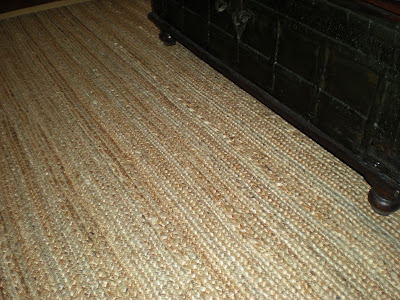 I mean, we knew the natural fiber rugs would require a tradeoff of being less plush in order to be more durable... but we like to walk around barefoot in our home and these were not going to cut it. After we paid for a microplane grater/zester and a little teal vase (yay for using some of those gift cards! ), we headed out, only to find Chicago was experiencing a complete downpour. Wind whipping umbrellas, torrential rain, everyone on Michigan Avenue huddled inside stores or under awnings... An umbrella, Hunter rain boots and a hooded jacket were no match. Scott was nice enough to run for the car and pull it up, but we both ended up wet (well, he was drenched). After a morning of playing softball, he was hungry too, but we wanted to get something accomplished so... on to Pottery Barn! 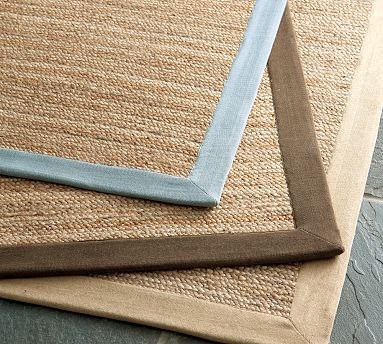 I had been stalking the Pottery Barn catalog for rugs too and found a couple I liked that were around $300. As always, they had some lovely ones that were closer to $450 (the salesperson's favorite was in that range), but I made it clear I wanted to stay around $300 and find one that was lighter in color but not too light. 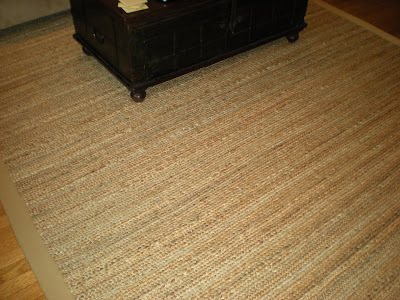 We didn't need dirt and stains and our messy life showing up on our new rug. And there it was... the color-bound flat-braided jute rug. Bordered in a light beige, full of different browns, braided in a soft and comfortable way, I made a quick decision. At this point, Scott had stopped talking out of starvation and was simply standing there, dripping and hungry, so he just nodded in agreement. 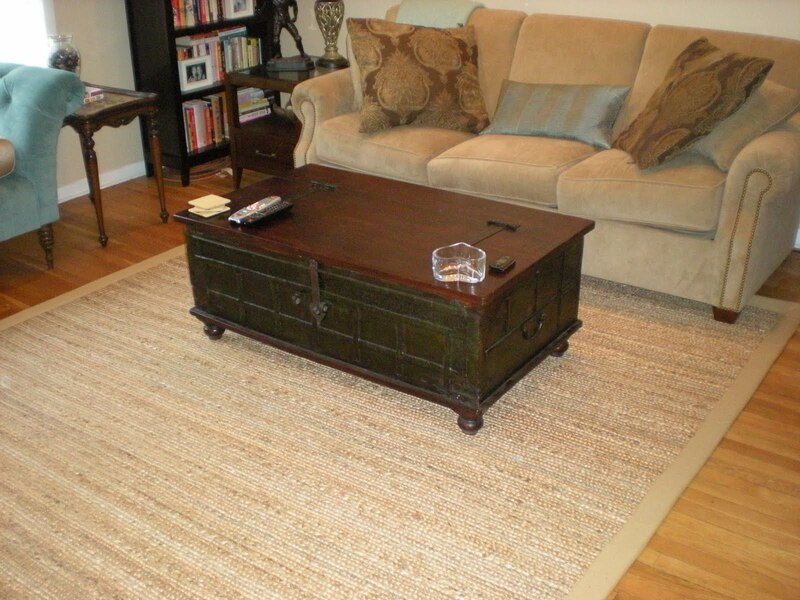 (Please note, no husbands were harmed in the purchasing of this rug.) They had the 8x10 rug in stock (the last one... isn't that always the case?) and we took it home! ﻿﻿Considering the speedy decision, I was a little nervous. 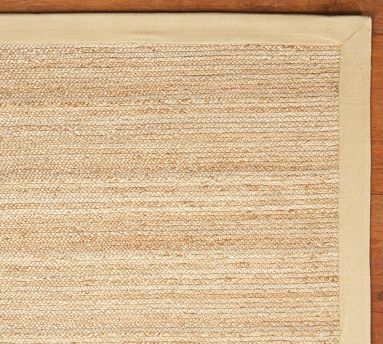 I had already mulled over the rugs in the catalog and examined them in the store, but it's different after you have plunked down $300 and driven it home and unrolled it under your huge couch and extremely heavy coffee table. I shouldn't have worried... we rolled it out and the rug was just right! And I think that was around that time that the rain stopped too... thank goodness. 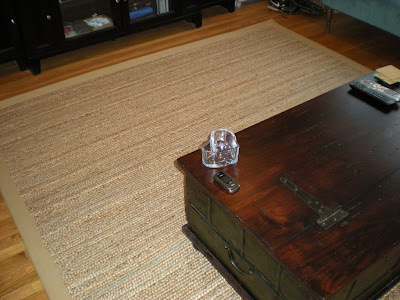 Even today, Scott mentioned how much he likes the new rug. We spent some time in the sun this afternoon with friends... it's a beautiful day finally! Hope you enjoyed the holiday too. You're right! It's the perfect rug! And I like the way the trunk pops on it with the contrasting colors.